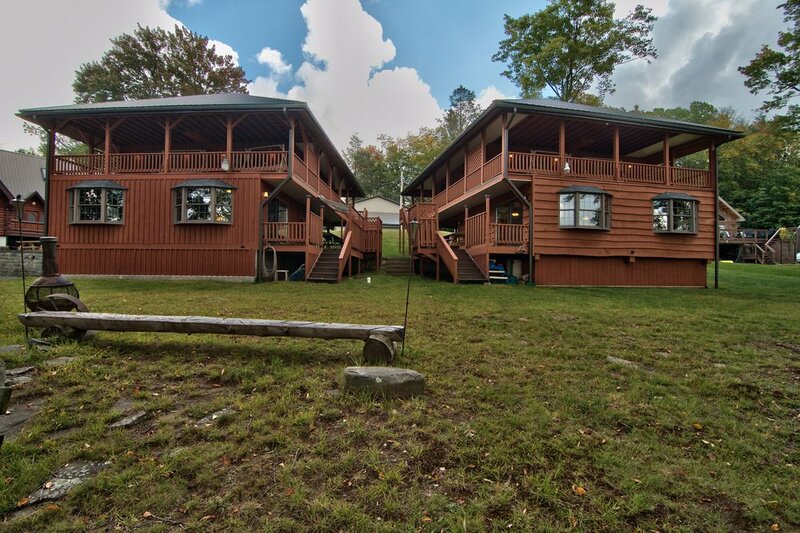 If you've booked your vacation at our beautiful lakefront Cottages on Lake Wallenpaupack, please read this FAQ to learn more. Please note, our staff compiled a comprehensive list of all appliances, items, etc. in the property; if it's not listed in the Answers, the house does not have it. If you'd like a copy of the FAQ to print, please click here. Q: What is the minimum age to rent these homes? Q: Do the houses have air conditioning? A: Yes, there are window units in each bedroom and 1 wall unit in the living room. There are also ceiling fans as well. A: Yes. Sleeping bags are provided for the convertible chair beds. Q: Will the GPS take me to the houses or will I need directions? A: The GPS will take you right to the houses! Q: Is there parking at the houses? How many cars can we park? A: Yes, there is a shared driveway and can accommodate 6 cars. If you will have more than that, please call. A: Place in the dumpster provided at the end of the driveway. Q: Are the homes lakefront? A: You may bring or rent a powerboat for boating on Lake Wallenpaupack. If you intend to go boating during your stay, please review the section in our General FAQ concerning the water levels to make sure your stay occurs within Lake Wallenpaupack’s boating season. A: This property has 2 large docks that can hold up to 4 boats. Lake Wallenpaupack can accommodate any size boat with any motor. The docks always have at least 4 feet of water at their end, which is plenty of room for a large boat. A: Ironwood Point or Ledgedale. For more info, please check out our Boat Rentals/ Boating Info page. There are 4 convertible chair beds and extra air mattresses as well. A: There are 2 TVs in each cottage. 1 in each living room and 1 in each loft. Q: What entertainment options do the houses have? A: We have Netflix, a Smart TV, a DVD Player, a Stereo, Cable, WiFi, and HDMI Ports. Q: What other options for activities do the houses have? A: This house has Board Games, Card Games, and you can hook-up your own video game consoles! Q: What appliances and supplies do the kitchens have? Q: What other amenities do these houses have? A: Each house also has a Washing Machine, Dryer, an Iron/ Ironing Board, a Vacuum Cleaner, Hair Dryer, and Hangers. Q: How much dining room seating is there? A: 11 people: There's room for 8 at the table and 3 at the bar in each home. There's lots of outdoor seating throughout both homes. A: 6 people per house. Q: What kind of grill do these houses have? A: There are 2 propane grills and there is plenty of propane provided. A: Yes, there are 2 kayaks and 1 standup paddle board per cottage. There are many assorted life jackets of all sizes. There are no beach chairs, though there is seating near the lake.